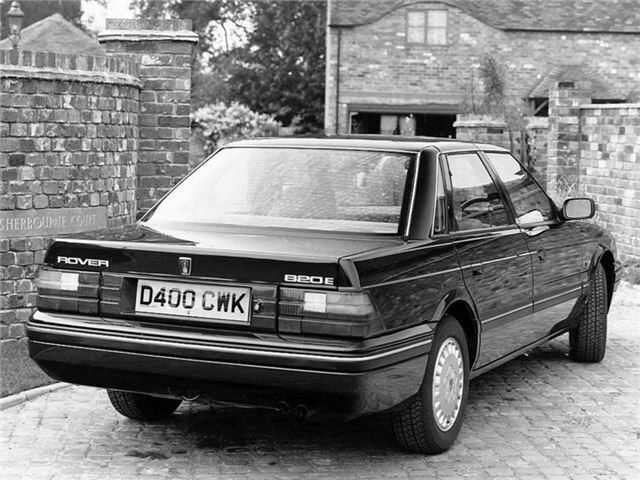 The Rover 800 can be divided neatly into two camps: Honda and Rover engined versions. Of course, as can be seen from the table above, the story is somewhat more complex than that, with a bewildering array of variations. However, between 1986 and 1996, all petrol engined 4-cylinder 800s were powered by British engines, whilst all 6-cylinder 800s were Honda powered. After 1996, the Honda units were dropped in favour of the original KV6 engine, a development of the K-Series inline-four found in the Metro/100 and 200/400. As well as these, 1990 saw the launch of the VM-powered turbodiesel. When launched in 1986, the 800 was only available as an angular (abeit attractive) four-door version, but was joined by a five-door “fastback” (not hatchback, if you please) in 1988. The fastback was also made available with the 8V O-Series engine, but this low-cost option did not prove popular. The line-up remained this way until its demise. In 1991, the R17 version of the 800 was launched – it is best described as a heavily revised version of the original (which shared its side-doors and some underpinnings). Unlike its predecessor, the R17 was launched in two forms, 4-door saloon, 5-door fastback. This was joined by a 2-door coupe in 1992. The body received no further significant revisions. The M16 inline-fours were available in single and multi-point injected form, and both delivered good performance in relation to their opposition. Like all early 16Vs, these cars needed to be revved to get meaningful performance. The Honda V6 was ultra-smooth, but like the M-Series cars, needed to be revved in order to deliver its best. Excessive press criticism encouraged Honda to rectify the situation, and the 2.5-litre V6 was replaced by a 2.7-litre version in 1988. When the R17 appeared, M16 was replaced by the heavily revised T16 engine. Majoring on torque, the new power unit (effectively a nuts-and-bolts overhaul of the M16) was made available only in one normally aspirated state of tune. T16 was also available in turbocharged form (for the Vitesse); initially 180bhp, but this was supplanted by a 197bhp version. The Honda V6 engine remained unchanged. KV6 engines joined the fray in 1996, replacing the sweet and capable Honda unit. The O-Series engine fitted to the 820 fastback is rugged and generally very reliable, but M16 and T16 engines had a tendency to leak oil – so check that this is not too bad and that oil levels are correct. These engines are critical for cambelts, so ensure that this has been done timeously. If there is no evidence of service history, think carefully before buying. The same holds true for the later M-Series engines, including the oil leaks. Turbocharged versions are mechanically rugged, but do suffer from problems with their ECUs and associated control systems. The Honda V6 engines prove exceptionally reliable, although can develop noisy tappets in later life. This is not serious, it is recommended to keep these adjusted correctly. Cambelts need replacement every 46,000 miles (Rover recommended 90,000 later in life, but stick to the lower figure for piece of mind), and it is essential that this is adhered to. With careful maintenance, these engines will last over 350,000 miles without the need for a re-build. KV6s, on the other hand, have proven troublesome in service. In particular, ensure that there is no evidence of “mayonaise” in the oil, as they are susceptible to head damage. pay careful attention to service history and walk away if there are any doubts. Manual gearboxes: the PG-1 ‘box in the four cylinder versions is particularly sweet to use, but can chew differential bearings. Automatic gearboxes in M-Series versions, have proven particularly troublesome, with flexi-plate failures – not catastrophic, but costly to repair. V6 Honda autos are generally sound – although make sure that they have been filled with the correct Hondamatic fluid. The JATCO unit in the later KV6 has also been known to cause particular grief. The 800 does not appear to suffer too much in this department, and the police found that brakes lasted well on their V6s. Pedal feel is slightly “soft”, so don’t confuse this with “spongey”. On ABS models, make sure the warning tell-tale lights up when the car is switched on, but then goes straight out. If this light stays on, you’re looking at replacing the sensors, at the very least. A lot of hassle, and a safety issue. The steering on the Honda version is speed sensitive, and should weigh-up with speed. Ensure there are no groans or knocking when turning from lock to lock at rest. Four cylinder versions use an entirely different “Positive Centre Feel” system, which is also very light. The potential enemy of all Mark one 800s is rust. Rear wheelarches, leading and trailing edge. Sunroof mechanism and drain holes. Outer sills (on mark ones). Leading edge of the bonnet. Mark two 800s should suffer much less thanks to better paint and underseal quality. Interior grab handles can break off in your hand on early models, switchgear is very fragile on pre-1990 models, wipers, headlamp control can cause problems. Seats are excellent, front and rear, but show signs of ageing on the lighter coloured models. Electric windows can cause concern, trip computers can be erratic, ignition and ECU problems on earlier models, alarms with minds of their own and immobilisers that immobilise when you don’t want them to. Usually these problems are fixed by replacing sensors or micro-switches, but do test everything fully on a test drive to save heartache later on. Airflow meters are known to fail on the multipoint 820s (ie., 820i, Si and SLi). Singlepoint 820s (i.e., 820E, SE) require ECU reprogramming after a battery disconnect, so ensure that if you buy one of these cars, the battery is connected and good, and that the car is running sweetly. If buying a Mark two 800 from about 1995-onwards, ensure that the four figure immobiliser code is supplied with the car (about £10 from a Rover Dealer) otherwise if the remote keyfob fails, the car is very effectively immobilised. Underrated “metal for money” buy that is set to remain deeply unfashionable for some time to come. Demand for early V6 Vitesses and Sterlings now strengthening, but it is still possible to buy well-cared for examples of the 800 for very little money. As there is still a wide choice to be had, if you want a good one, you can afford to be very choosy. As with all things in life, you get what you pay for, and if you buy one without service history, you can get your fingers severely burned. Pick of the range would be a Honda V6 powered version, possibly an 827Si manual, which would benefit from the Japanese drivetrain, but has less in the way of electrics to go wrong. Post 1992 T-Series models also better than one would imagine, but with such a large amount of poor examples still out there, it pays to seek out one with a full service history and low mileage. Well cared for examples of T16 and T16 Turbo 800s should also give a long life, if well maintained.